Previously we introduced sapphire as a gemstone and as a major industrial material that spurred the advancement of many synthetic crystal growth techniques. Synthetic sapphire is commonplace in our everyday lives, as its desirable properties—optical, mechanical, thermal, chemical, and structural—have yielded an array of fascinating applications. A turning point for synthetic sapphire was the invention of the laser in 1960. Theodore Maiman, using a Verneuil-grown ruby crystal fashioned into a rod, demonstrated the first optical laser. The quality of ruby from flame-fusion growth was inadequate for commercial lasers, prompting the synthesis of sapphire using the Czochralski technique. To this day, laser crystals of a variety of compositions are still grown this way. Ruby crystals, traditionally grown for military range finders and cosmetics applications such as tattoo and hair removal, have largely been replaced by other laser materials. Ruby lasers are now mostly used for producing holographic images and drilling small holes in diamond. Another significant laser crystal is titanium sapphire, often produced by the Czochralski technique or the heat exchanger method (figure 1). Titanium sapphire lasers, with their ability to produce extremely high-energy and ultra-short pulses (pico-, femto-, or even atto-second in duration), have been instrumental in advancing fundamental research and may hold the key to realizing nuclear fusion energy in the future. Once the ability to grow large chromium-doped ruby crystals was established, scientists began developing undoped synthetic sapphire (generally called “white sapphire” or “leucosapphire”) as a durable and highly transparent material. The 1960s saw the advent of low-defect crystals with high chemical purity used in protective laser coverings for the military, aerospace windows (figure 2), bulletproof armor, and various scratch-resistant surfaces. Sapphire, with its desirable insulation and structural properties, was a suitable substrate material for single-crystal semiconductors such as silicon (1963) and gallium nitride (1969). This opened up even more market opportunities, including faster and more energy-efficient circuitry, as in the Hewlett-Packard 41 series calculators developed in the 1970s. The technology also permitted shorter-wavelength light emitting diodes (LEDs) in blue, ultraviolet, and white. Sapphire substrates have grown considerably larger, to 10 inches in diameter (figure 3). Consumer applications of synthetic white sapphire eventually followed. We’ve all heard the familiar “beep” at the checkout counter when merchandise is slid across the scanner window next to the cash register. The top layer of that window is made of a very thin piece of sapphire, which keeps the glass free of scratches, allowing countless items to be dragged across it without the need for replacement. First developed in 1978 (figure 4), this application is now seen in retail outlets worldwide. Sapphire windows can also be used to protect biometric fingerprint sensors. There is speculation that smartphone companies may be interested in this technology, and that’s just the beginning of that industry’s synthetic sapphire possibilities. Figure 4. This photo shows the very first sapphire point-of-sale window prototype. Courtesy of Frank Bruni. To read more about this prototype, visit http://frankbruni.com/uncategorized/the-birth-of-the-sapphire-pos-terminal-window. Sapphire has been used as a covering for cellphone camera lenses, and it is also being tested by smartphone and electronic tablet manufacturers for shatter-proof display screens (figure 5). Some very high-end smartphones already have sapphire touchscreens. If every smartphone built next year had a sapphire screen, approximately one billion finished sapphire screens would need to be produced. Consumer demand for a scratch- and crack-free screen is high, and various market players and industry analysts have found a consumer willingness to pay an additional $30 to $50 for this feature. Even so, current synthetic sapphire capacity may not be able to meet the demand. Figure 5. Blocks of synthetic sapphire were used to produce these smartphone display screens. Courtesy of GT Advanced Technologies. 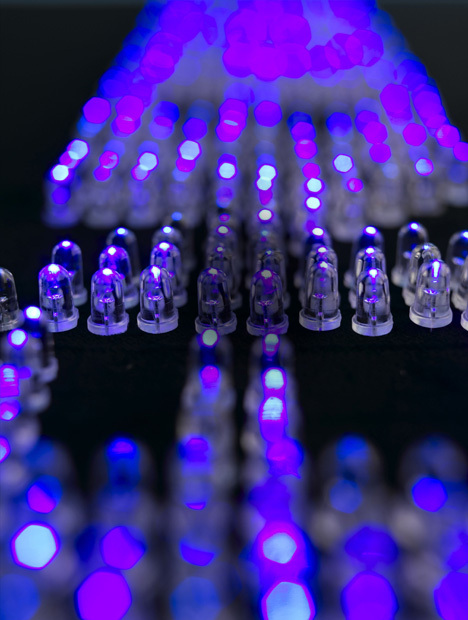 Sapphire substrates are being used to produce the next generation of ambient lighting, white LEDs. The white LED is actually a blue LED (figure 6) coated with a yellow-emitting phosphor, a combination that produces white light. The future is bright for LED lighting as the world strives to be more energy efficient and less reliant on toxic elements such as mercury. The demand for substrate sapphire is very large—in the millions per year and growing—and there is competition for resources among manufacturers of synthetic sapphire for various applications. cerium yttrium aluminum garnet to blue LEDs. Courtesy of GT Advanced Technologies. So where does gemology fit into this? Sapphire occupies a sizeable percentage of the synthetic gemstone market. But even as demand for synthetic gem corundum increases, the portion of industrially grown sapphire crystals used as gem materials is shrinking. With technical applications for sapphire on the rise, the synthetic gem industry will continue to feel the effects in product quality, supply, and pricing—topics that will be further explored in the fourth and final installment of this series. Jennifer Stone-Sundberg is managing director at Crystal Solutions, LLC, and a technical editor of Gems & Gemology. She specializes in crystal growth and characterization technology. See the first article in this series, which touches on the basic science and history of sapphire. See the second article in this series, which chronicles the advancement of synthetic sapphire and details various growth techniques. The fourth and final article in this series explores how an increase in synthetic sapphire technical applications has affected the synthetic gem industry.